The flavor of Old Santa Fe is beautifully captured by La Posada's cool adobe colors, courtyard gardens, and mesquite-burning kiva fireplaces—a hideaway for all the senses. Often, it's the attention to detail that elevates a resort from nice to incredible, memorable to unforgettable—and this is one hideaway that is loaded with details. 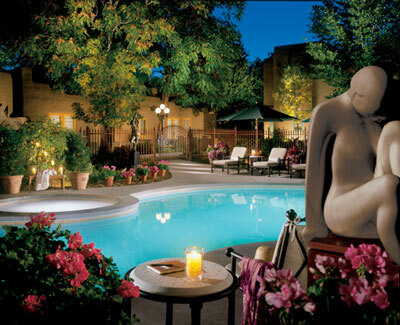 Impeccably cared for and oh-so-pretty, La Posada de Santa Fe has an abundance of distinctive little touches, such as the world-class paintings and sculpture that rotate among its gardens and indoor common areas, and the wrought-iron grillwork that graces its courtyards and restaurants. Located on six beautifully landscaped acres tucked behind adobe walls, La Posada lies in the heart of Santa Fe, just blocks from its historic Plaza and famed art galleries. Meandering flagstone walkways connect one- and two-story pueblo-style buildings. The lobby alone will seduce you, with its exposed wood beams, warm earthen tones, and kiva fireplace. While most of the resort echoes the town's Native American and Spanish colonial roots, the Staub House honors the Victoriana period during which it was built. A stately 1880 manse that forms the centerpiece of the resort, its high molded ceilings, boldly patterned fabrics, and dramatic chandeliers place you firmly in the town's evocative past. Across the way, at the main gathering place for tourists and locals alike, the resort's romantic Fuego restaurant slow cooks duck, pork, and lamb on its open rotisserie. Guest rooms, with their round viga timber beams, herringbone latilla ceilings, shady patios, and fireplaces, are a page out of Architectural Digest. Drink your fill of the city's 200-plus museums and art galleries, then relax in La Posada's immensely comfortable lobby and listen to native flute players while sampling a selection from its 900-bottle wine collection. The Southwest never looked and felt so good.